This vegan Miso Pesto Ramen is the perfect weeknight dinner. Quick to prepare, packed with wholesome ingredients, and incredibly savory. Whip up the pesto, get some noodles boiling, and grill quick-cooking shrimp for a balance dinner that comes together in 30 minutes. This Miso Pesto Ramen was inspired by Bon Appetit’s stunning miso pesto recipe. It truly had me at miso. 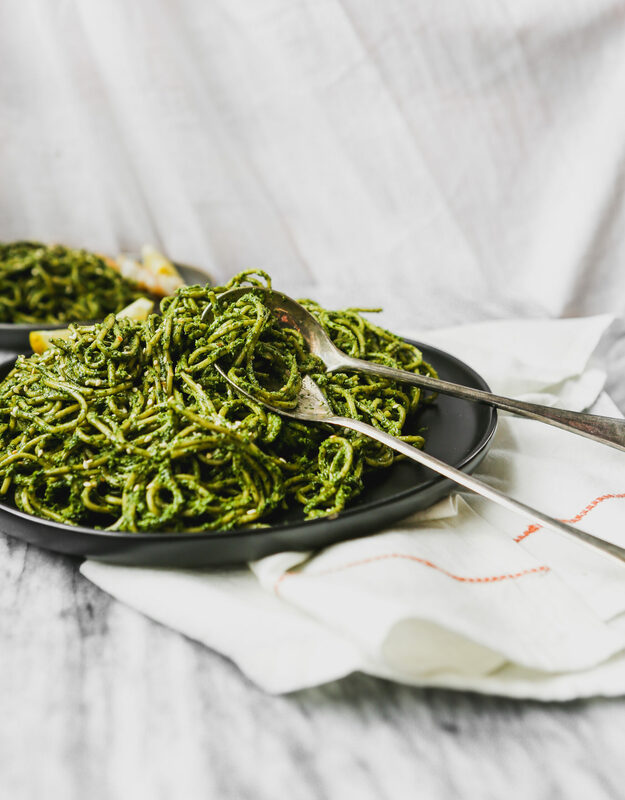 Their photo is so stunning and vibrant, plus just the idea of it—miso in pesto—I was hooked immediately. It’s such a great idea, and so simple. I immediately wanted to give it a try, but with my own twist on it. 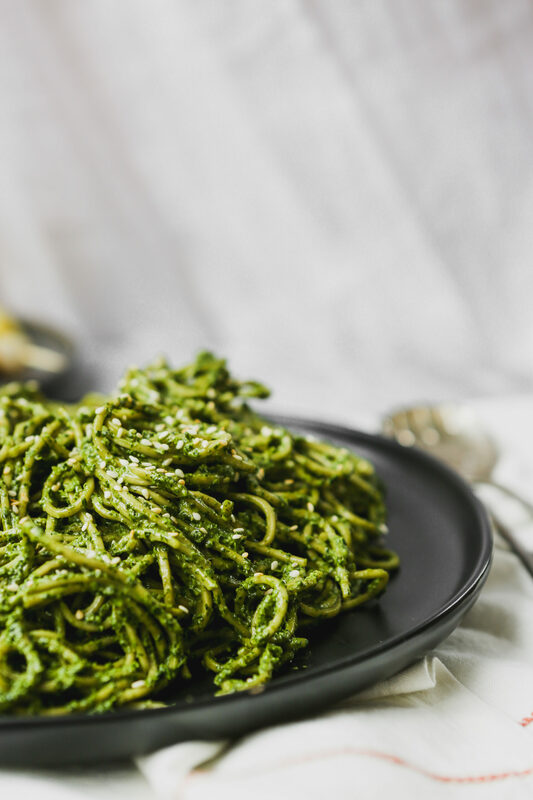 This Miso Pesto is earthy and savory, yet bright and vibrant, plus it’s packed with wholesome ingredients. To make it my own, I opted for dark leafy baby kale in addition to a hefty amount of cilantro and fresh lemon, olive (or avocado) oil, walnuts, and of course, miso. 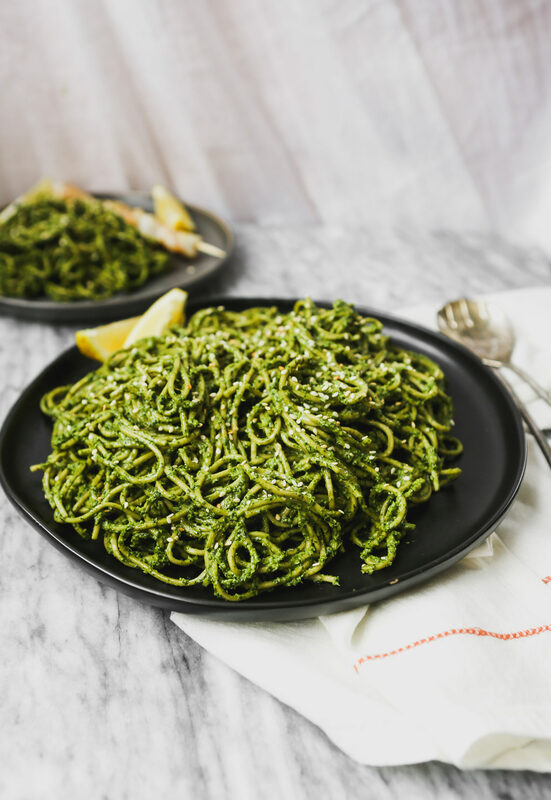 This pesto, tossed with ramen noodles (the good ones), then finished with perfectly grilled shrimp (optional) and toasted sesame seeds, makes for one helluva meal. I don’t know about you, but I like to make my own sauces, dips, and dressings. Mostly because I like the freedom of it, but also because I can control what goes into them. And it’s not that I can’t eat the same kind of salad dressings week after week, because I can. Hell, I’ll whip up a big batch of dressing or marinara sauce, eat it all week, and be very content. 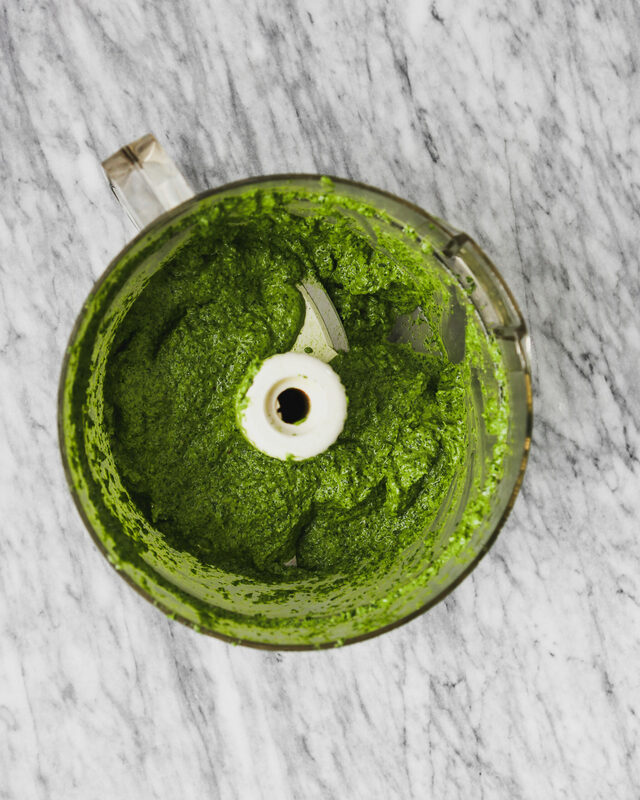 So it’s not that I get bored, I just like having the creative freedom—hence—homemade pesto. Plus, with just a few basic ingredients you can make just about any kind of dressing or sauce you like. Anyway, you’d think I’d be a great meal prepper, I sound like I have the makings to be one. Plus, my meals usually consist of separately prepared foods that I just throw into a bowl, like roasted sweet potatoes and veggies, greens, a cooked grain of sorts, and an egg. But realistically, I’m not the best meal prepper. I don’t make hummus on Sundays, or whip up massive batches of roasted veggies and prepared salads. It just doesn’t happen. And because of that, I need to have an arsenal of go-to dinners that take very little time while also being meal-prep friendly, because I can be hopeful, right? And did I mention G hates leftovers? Yeah, that’s a big one. It kills me. But secretly I’m kind of OK with it, because I love leftovers. Anyway, this Miso Pesto Ramen is one of those recipes. It comes together uber quickly, but can also be prepped ahead, leaving just the cooking of the noodles and the shrimp for the night of. To add fuel to this glorious weeknight-dinner-fire, the pesto freezes well, which means on any given night, dinner is just minutes away. And to answer your question, no, I do not have this pesto stocked in my fridge or freezer. I may aspire to be a meal-prep queen, but I’m far from it. A girl can dream, can’t she? This Miso Pesto Ramen is the perfect weeknight dinner. Quick to prepare, packed with wholesome ingredients, and incredibly savory. Whip up the pesto, get some noodles boiling, and grill quick-cooking shrimp for a balance dinner that comes together in 30 minutes. 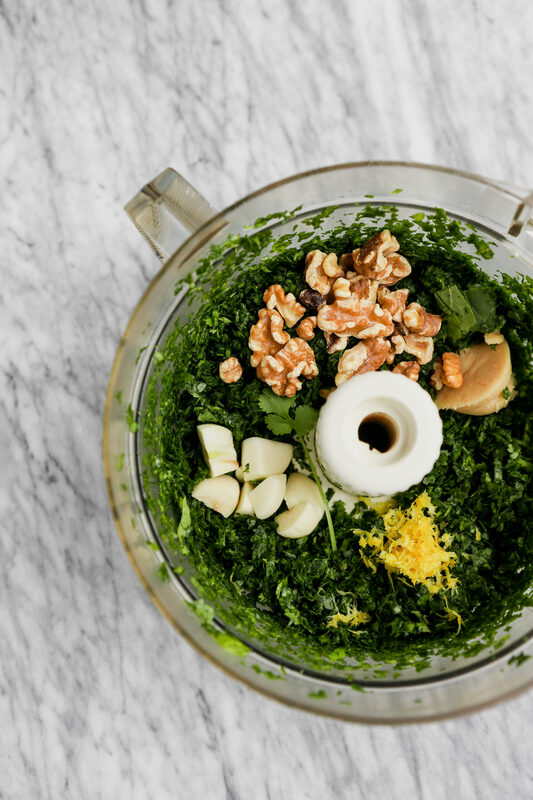 Process baby kale and cilantro in a food processor until finely chopped. Add walnuts, miso, garlic, sesame oil, juice, zest, salt, and pepper flakes; process until a finely minced and nearly resembles a paste; scrape down sides of bowl. With processor running, slowly drizzle in oil and process until smooth; season with additional salt and set aside. Season shrimp with salt and pepper, then thread onto four skewers. Coat a grill pan or cast iron skillet with nonstick spray. Heat pan over medium-high and grill shrimp until pink and cooked through, 2–3 minutes per side. Cook ramen noodles in a large pot of boiling salted water according to package directions. Reserve 1 cup cooking water, then drain and transfer ramen to a large bowl. Add three quarters of the pesto to the noodles and toss to combine. 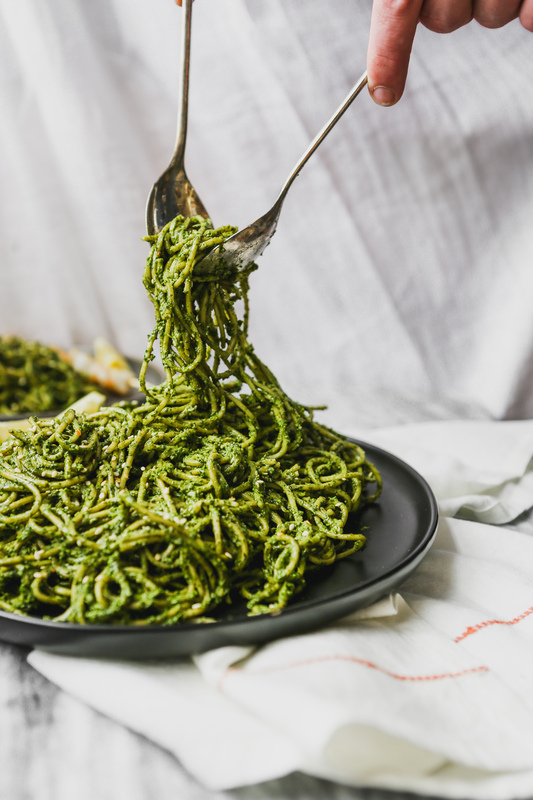 Add pesto to cooked noodles and toss thoroughly combine, gradually add reserved pasta water to reach desired consistency. 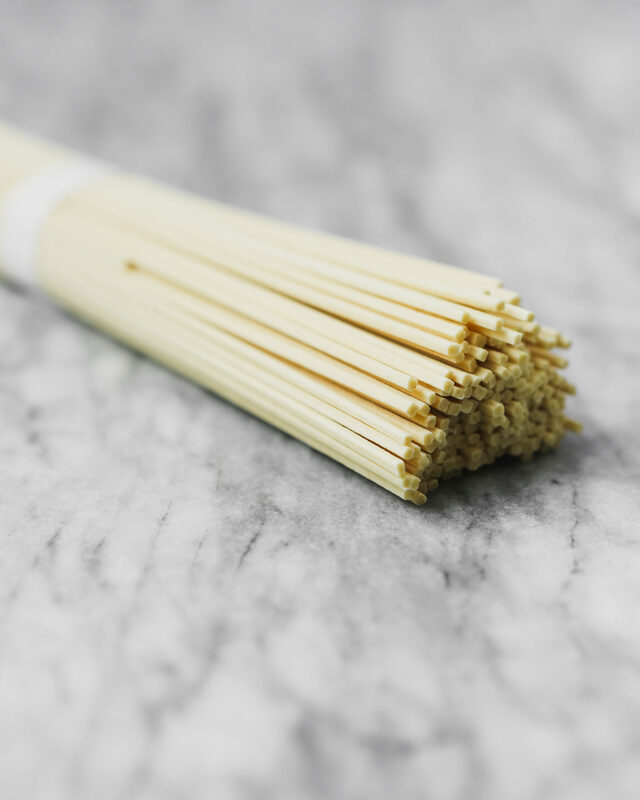 Divide noodles and shrimp skewers between serving dishes and sprinkle with sesame seeds. 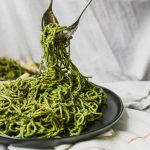 I have a strong distaste for cilantro but the miso pesto still sounds delicious–could I substitute the cilantro for basil? Basil would be a GREAT alternative to cilantro! I think that sounds delicious!